I actually should have posted this a few weeks ago, when I first finished the series… but oh well, :). Little less than year ago, my mom had to finally make the decision to retire from her position as a 4th grade teacher. It was a hard one for her, as she wanted to last 1 final year, before retiring. There were both practical and personal reasons for this: she had already committed to the school year, and leaving mid year wasn’t a nice thing to do to anyone, students or principal… and also, she wanted to feel like she had control over this one thing. But cancer moved into her spinal cord and started causing immense amounts of pain, such that she couldn’t stand for long periods of time, let alone maintain control over 20-some 9 year olds. While moving her stuff out of her classroom in December, a few books caught my eye, in particular the “May Bird” series. I finally got around to reading them last month, my mom had put them aside for me when sorting out books to be donated to various places. Anyways, the May Bird books are children’s books, but they have a particular twist which appealed to me: Most of the story occurs in the After Life. And Jodi Lynn Anderson’s Ever After ain’t your typical Pearly Gates or Elysian Fields. 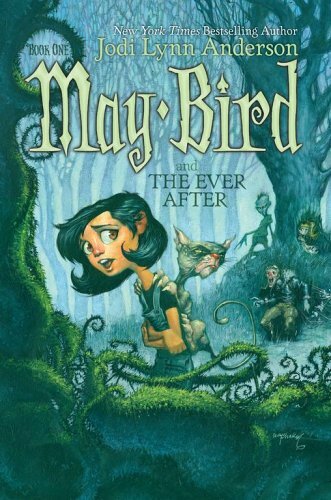 In the first book, May Bird (your stereotypical misfit) finds herself sucked up into the Ever After, despite being very much alive. Her naked cat, Somber Kitty, accompanies her, as does her disfigured/malformed “house ghost” Pumpkin. Being a “Live One” in the Ever After is Illegal, and being a Live Cat is even more illegal… We find out that the Ever After has recently been more or less taken over by a Dark Spirit named Bo Cleevil, and it seems that May Bird is destined to be the one who defeats him (according the Book of The Dead, no less). Her adventure includes meeting up with one of the beautiful and loving Grim Reapers, befriending a dead TB patient, Italian military officer, and Bee-Goblin Crossbreed, avoiding certain doom at the hands of the Bogey Man and his Shuck Dogs, and finally deciding to travel to meet with the mysterious “Lady of North Farm” who is the one who originally summoned May Bird to the Ever After. In the second book, May Bird and her companions finally reach North Farm, but they are pursued by an evil black fuzzy kitty, who just so happens to be considered one of the most dangerous Dark Spirits to ever exist. (This is the sort of absurdity which keeps the books light-hearted enough to be meant for children – otherwise the razor-blade mouthed clowns might lead to trauma) The lady of North Farm turns out to be a sort of Gaia figure in a way…. she has “always existed” and spends a lot of her time disguised as stars in the sky, lines in the sand, or a face hidden behind leaves. She informs May Bird that her only way out of the Ever After is a portal in the Bogey Man’s bedroom. Consequently, she has to travel to the territory of Dark Spirits. Along the way she meets up with some other “Live Ones” who vow to help her, as they believe she is indeed the savior of the Ever After. 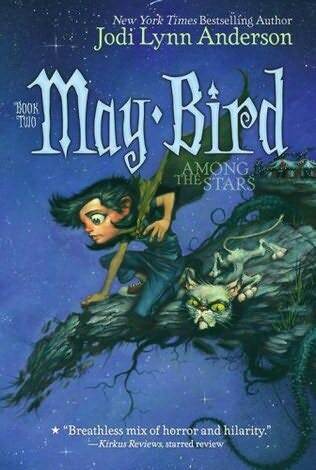 After entering the realm of dark spirits, May Bird has a chance to rescue one of her friends, who had been swallowed by the Black Water in the first book, and then she has a brief run-in with Bo Cleevil, but is forced to escape with Somber Kitty through the portal in the Bogey Man’s closet. The book ends with her being reunited with her mother in the world of the living. 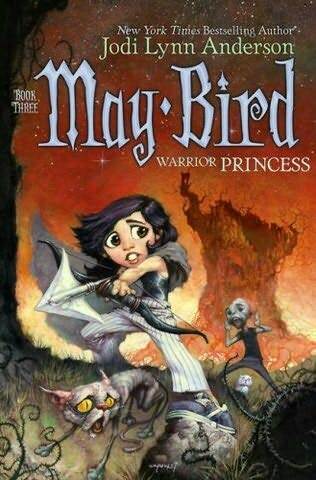 The third and final book, May Bird, Warrior Princess, takes place several years later. May is now 13, and rather disenchanted with her life as a “normal” 13 year old. She has had the nasty shock of discovering no one believes her tale of adventure in the Ever After, not even her mother. On her birthday, she suddenly receives a mysterious phone call. She only hears one sentence: “We need you” and recognizes Pumpkin’s voice. Later, there is a black-out in the middle of her birthday party, and her insistence that “Its the ghosts!” send her guests away screaming. That night, determined that they are coming to take her back to the Ever After, May Bird puts on her “Warrior Princess” outfit, and goes up to the “Widows Walk” on top of her house with Somber Kitty…. We have to chalk up her lack of better judgement to her desperation, as it is the middle of a snow storm. Needless to say, she falls off the roof (so does Somber kitty), and dies (so does Somber kitty). Being dead doesn’t make things much easier for her in the Ever After, as she discovers that Bo Cleevil has successfully rounded up most of the inhabitants and imprisoned them in his fortress town to the North. Even North Farm has shriveled up and the Lady is missing. Fortunately May Bird is reunited with her previous companions (who haven’t given up the fight), and they make a final attempt to destroy Bo Cleevil. I’ll skip the details, so as not to spoil it for you, but May Bird and Somber Kitty do make it back to the land of the living in the end (hey, its a children’s book – not to mention that we hear the grim reaper in the first book tell May that she isn’t due for another 80 years). If you can’t tell from my jumbled mess of a summary – the books are full of detours and details, but its not so much that you get confused. Things are nicely pieced together throughout the story and the details help give the characters their personalities. The books seem big – but that’s because the print is larger than normal. These three books actually could be put together as 1 large book with three parts, and it probably wouldn’t be much bigger than one of the later harry potter books. I read the first two books in about 2 days each, and the 3rd book probably took more like 3 days. This book was an unexpected discovery I made one day while browsing the arts & crafts section at my local used/new book store. I was actually looking for stitching patterns or crochet books, when I saw this book laying out in the book shelf’s “display” section. Lately I’ve been thinking a lot about setting up an Etsy shop, or maybe doing some consignment arrangement, in order to sell a few of the many crafts that I’ve made. It was a used copy, and marked down 50% of its “new” price, so I went ahead and bought it. While I haven’t read straight through it, cover-to-cover, I have browsed it extensively. Its a very useful and practical guide to setting up a small craft business. I particularly found the parts about branding, copyrighting, and pricing to be useful (although, for copyrighting, the book basically says “get a lawyer”, lol). The book is peppered with various “case-study” type examples collected from successful artisans. Additionally, there are multiple appendices filled with lots of useful links and information at the end of the book. Chapter 1: Do you DIY? This chapter discusses the handmade / indie trend’s history and popularity, as well as suggesting that you do some serious thinking regarding your expectations and motivations for getting into selling. This chapter is focused on all of the small and big things that you need to take into consideration when naming, organizing, and running a small business. Topics include pricing, boosting production, organizing a workspace, and keeping track of income/expenses and legal issues like taxes and copyright. This chapter includes information about different ways to sell your products. For instance: online sites like Etsy vs craft shows vs consignment shops. It also talks about building a website and customer service, and even bartering your crafts for services and goods! 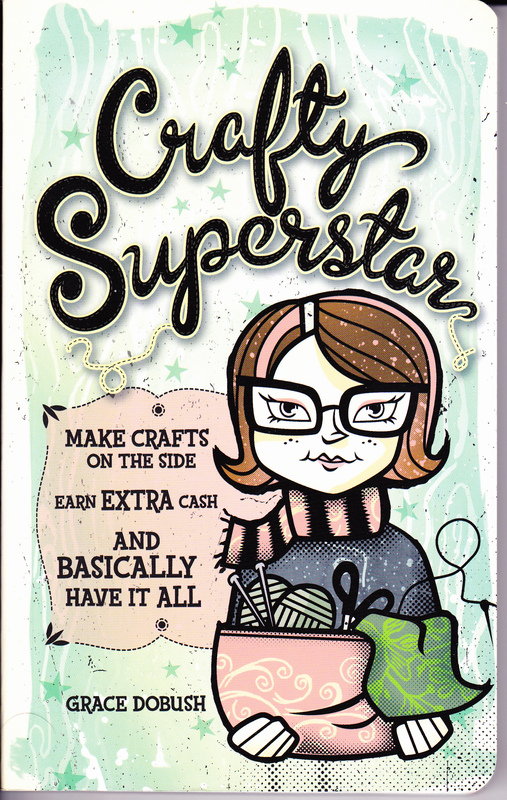 This entire chapter is devoted to the notion of selling at craft shows, which, despite the rise of the digital era, is still probably one of the most popular and most utilized methods of selling crafts. The chapter talks about things like applying for shows, prepping products, creating displays, networking while at the show, and hosting your own show. This chapter is all about marketing your business and building up a customer base. There are some suggestions about getting coverage in magazine and blogs. This final chapter is about balancing your day job, family, and craft job, as well as maintaining your inventory. It has a few recommendations regarding either reducing your crafting business, or increasing it to a full time gig.